Radon can work for you and not against you! 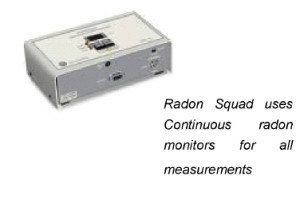 R adon Squad provides Radon Measurements for real estate professionals, homeowners, home inspectors, home builders, developers, lendors and home buyers. We can provide you with quality, continuous hourly testing for real estate transactions and post radon mitigation testing. The radon monitor is placed in the home for 48 hours, during this time the computer reads and processes information from the environmental sensors on an hourly average along with the hourly radon reading. At the conclusion of the test you will receive a printout of your results. techniques usually rely on “passive” radon control. These systems reduce soil gas entry points and provide a route to vent the gases to the outdoors. A fan may need to be installed to further reduce the radon level. 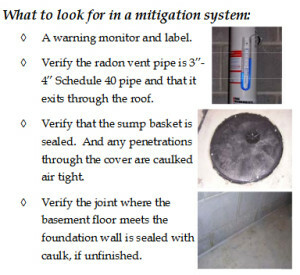 MN State Building Code is now going to require that builders install radon reduction systems in all new homes. In a weak real estate market having a radon mitigation system in an existing home makes the house more marketable. Home inspection companies are beginning to offer radon testing as part of the inspection. Contact us for a free consultation today! Website Designed by JMJ Website Design.